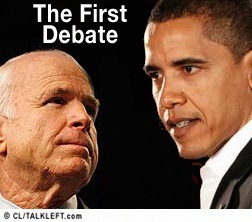 The Mississippi debate between Senators Barack Obama and John McCain begins at 9pm ET on CNN. They will probably stream it if you're not by a tv. Big Tent Democrat, the TL Kid and I will be live-blogging.